Have you read part 1 and part 2 of this agile working series? In Part 1 we covered definitions and benefits of agile working. In Part 2 we explored the business case and mindset required to create a more agile workplace. In 2004, a Dutch insurance broker found themselves in crisis. They’d been taken over by a publicly listed multinational at the end of the 90s. Shortly after, the Netherlands branch was in serious trouble. The decision was taken to downsize. Shockwaves rippled through the workforce, as long-term employees were let go. Meanwhile, the insurance market had grown more dependent on client fees as opposed to commissions. Revenues plummeted. The Dutch leaders of the subsidiary went in search of a new strategy. They had to find a way of adapting to change. Drastic events called for drastic action. First of all, the business model had to pivot: from a traditional insurance broker model, to a business consultancy specializing in risk management. This transformation demanded new ways of working. Suddenly the ability to share knowledge was vital. As was the need to work from anywhere, any time. They had no choice but to embrace a more agile way of working. To achieve this, they chose a radical implementation of ‘New Ways of Working’ (NWW), an organizational design concept that had emerged in Holland through the 90s and early 2000s. What is New Ways of Working (NWW)? New Ways of Working was an early manifestation of Agile Working. It’s also worth noting that the term NWW is sometimes used interchangeably with ABW: Activity Based Working. Both involve aligning the way you work with your business strategy, culture and values, to drive successful outcomes. 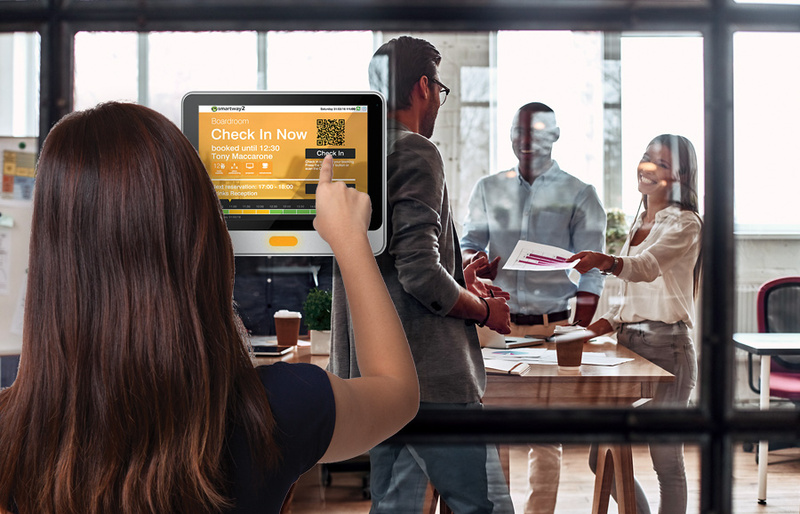 They typically reduce the amount of physical space you require, increase flexibility; and use technology to improve the employee – and ultimately the customer – experience. 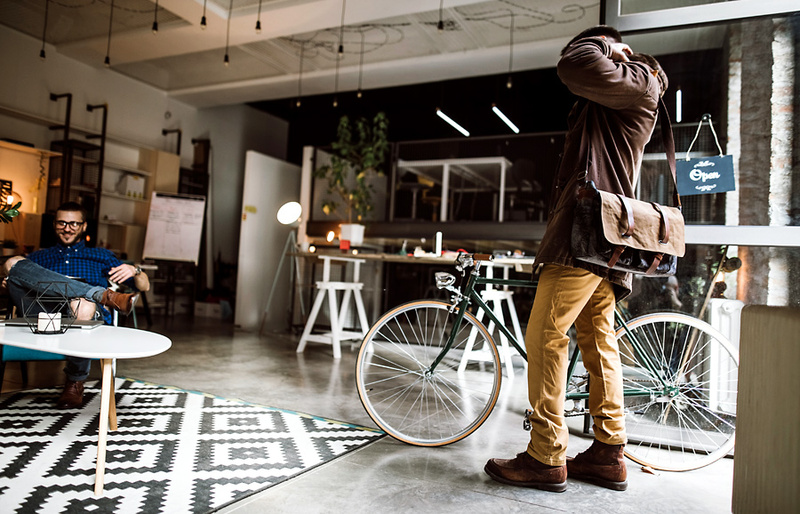 Think of ABW as a sub-set of agile working: the part that focuses specifically on how physical space can be used to support and influence activities and culture. ABW, at its core, is the practice of designing your workspace to suit the type of activities being performed. For example creating separate spaces for focused and collaborative work. What are the benefits of NWW / ABW? A host of research studies have shown that NWW increases autonomy – an essential component of motivation and therefore high performance. Then there’s the positive impact on informal learning. Informal learning is essential to creating a learning organization. In turn, creating a learning organization is essential for survival amidst the accelerating pace of change brought about by technology. Not to mention future-proofing our individual skill-sets against major impending labour shifts, driven by AI and automation [read more about all this stuff in our free ebook – Your Definitive Guide to The Future of Work]. That’s not all, NWW has been linked to higher employe engagement, employee performance, productivity and organizational commitment. But where do you begin, when it comes to implementation? First of all, it’s important to understand the basic pillars and components of agile working. 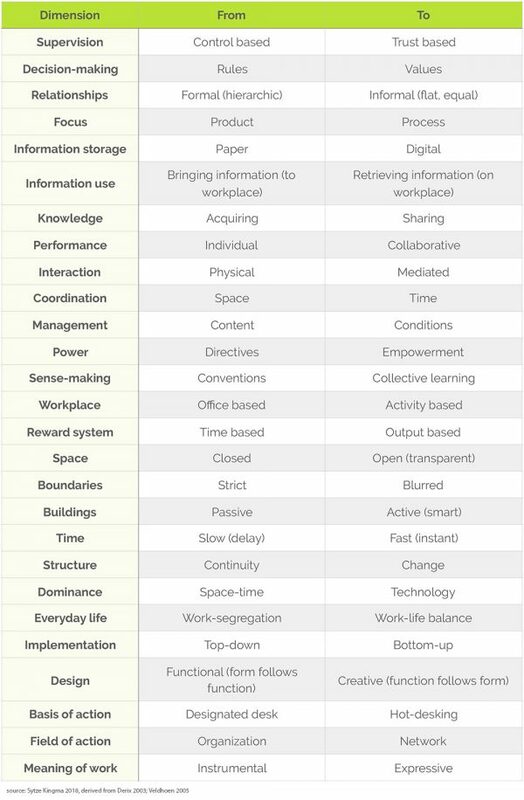 This table provides a framework for understanding how agile working is changing the way we approach work, across many different dimensions. Who is responsible for implementing agile working? Facilities Management, IT and HR all play a fundamental role in creating a more agile organization. So one of the first steps in your journey towards agile working, is to assemble a crack team of collaborators that represent each function. Workspaces can exert a powerful influence on culture, by changing the way people feel and interact. Yet our spaces and technology can’t be considered separately. People must be equipped with the technology they need to do their best work. Not just in the office, but at home and anywhere in between. Check out this post on How to Create a Workplace Strategy. What’s more, retraining needs to happen in parallel with workspace changes. If one happens without the other, productivity suffers. By analyzing the activities in your organization, you can design physical spaces to accommodate them. Collaboration might require open spaces, meeting rooms, booths, enclosed and semi-enclosed rooms, project tables and creative brainstorming areas. Process work is likely to require desks, with consideration given to ergonomics, standing vs sitting desks, permanent vs hot-desks. Focus work often requires private desk and booth space, with reduced noise and fewer distractions. That’s great, but what happened to the Dutch insurance guys, I hear you ask? The Dutch insurance company set about introducing new practices to increase openness and flexibility. Taking pains to analyze all their key working processes, they examined the interactions that take place as work is executed. They also evaluated what technology would be required to enable people to work anytime, anywhere. This involved finding ways to make it easy for everyone to access the information they need to do their job, regardless of time and location. The emphasis had to shift from bringing information, to fetching information. This shift in itself strongly influenced the layout of their workspaces. They made an important decision early on in the implementation of NWW. To start from the premise that customers are trustworthy (unless proven otherwise). This meant they could pay damage claims quickly, using lean processes. They no longer required proof in advance. Instead, they’d perform checks on claims after payments had already been made. The next part of this decision was equally impactful. They extended the same level of radical trust to employees. All of a sudden employees could make their own decisions about where, when and how to do their work. They were trusted to make their own decisions about client claims. They changed the way they rewarded employees, to a system based on output, not presence. They eliminated hierarchy by focusing on roles that relate to tasks and project roles, as opposed to power and position. They ditched controlling management practices in favour of coaching. The restaurant was transformed from a place for grabbing lunch, to a place for meeting and working. Single-function areas, including corridors and lobbies, were turned into informal lounge areas and shared spaces. They clustered activities and used open staircases to vertically integrate work areas. Before the change, the insurance company had designed their spaces to align with the flow of paper. The transition to NWW was a redesign of space based on work activities. Different work activities demand different combinations of individual, collaborative, physical and virtual work. By unpicking the sorts of activity going on in their company, they could integrate and cluster the work into different purpose-built spaces. For instance they ended up with cockpits, that enabled people to make phone calls or do focused work without distractions. Others chose to do this kind of thing from home rather than use the cockpits. Team rooms were set up for meetings with colleagues, clients and other visitors. Then came silence areas, lounges, comfort rooms, and various open plan workspaces. They split the workspace into small club houses, creatively designed to give people a sense of shared identity. This change recognized that human beings work best when we feel that we belong. When we feel we are reaching our potential, together. Another goal was to design an office interior that embodied transparency, output measurement, client orientation, collaboration; and cross-departmental, cross-team communication. The new workspace design got rid of most internal walls and all private offices. Any remaining walls were made of glass, to support their goal of transparency. Conference rooms had removable walls. They split the ground floor into orientation zones, each focusing on a particular group of clients or market niche. People could suddenly choose where they wanted to work, depending on the task at hand. This meant they found themselves in many different spaces throughout their working week, as their activities changed. Great workspace design brings out the very best in each of us. The interplay between physical space; technology; and human passion, creativity and engagement is often underestimated. When it comes to designing an agile workplace, not only does form follow function, but function also follows form. In other words, we can design workspaces around activities and behaviours; and in turn the workspace can change the way we act and behave. The same goes for technology. Technology can support and streamline the way we work, as well as shaping the way we work. For example, at Smartway2, we help organizations define ‘rules’ for booking meeting spaces, services and facilities. You might, for example, set rules for a particular room. Maybe it can only be booked by certain people, or requires approval. Maybe you can only book the AV room if you’re actually using the AV equipment. Then you could have rules around things like booking catering. Perhaps a working lunch requires at least 2 hours notice, to prevent the chaos created by last-minute requests. Embedding these rules in the tool you use to make and manage spaces and things in your office changes behaviour. People find themselves working more efficiently, rather than creating undesirable knock-on effects. Providing workspaces and tools that subtly inform people about what actions should and shouldn’t be taken – when, where and how – reduces the need to refer to explicit rules. Explicit rules are typically policies, existing in some kid of manual, e.g. a clean desk policy. With smart workspace design, you can mitigate the need to dust off manuals and heavy handedly ‘enforce’ rules, because the correct behaviours simply emerge as a by-product of using well-designed systems. So what did the employees think of this shift in the Dutch subsidiary? Truth be told, they weren’t all on board, as is usually the case with change. There were a few resistant skeptics. Some were concerned that time and location independence could actually lead to greater management control over the workers. Others worried that it would only increase their workload. Then there were the inevitable fears of further layoffs. Three project groups were formed, each responsible for objectives around space, technology and culture. In comparison to people, technology and space are relatively easy to change. Humans, on the other hand, have deeply embedded routines, habits and attitudes. That’s why training was a vital component of the transition. To facilitate flexible, virtual working, people were no longer judged on how much time they spent in the office. Instead, performance was measured using balanced scorecards that sought to align strategy and culture. HR was responsible for formulating rules around around each area, but keeping it simple – only about a dozen in total. For example paperless working required stringent rules around information-handling, to maintain data privacy and security. Hot-desking required rules around clearing your desk if it was going to be unoccupied for more than two hours. Conference calls had a set of rules around good listening practices and keeping appointments. Then there were rules around flexible working, mobile working, collaboration, working from home, output measurement, information sharing… all in support of greater agility. Searching for explanations and solutions outside one’s own scope of behaviour. Yet despite the adjustment required, change started to happen. At first, there was a transitional period that blended the old traditional, 9-5, departmental, desk-bound approach with the new, autonomous, agile approach. Over time, managers, project group members and consultants came together to tip the balance towards full-blown agile working. Soon after the changes kicked in, suspicions and concerns quickly evaporated. A number of deeply skeptical people, or those who didn’t like the new, open environment, choose to leave. To the rest, the benefits were self-evident. The Dutch subsidiary measured success through interviews, surveys and observation. Interviews helped them understand the views and experiences of those involved. Observation, on the other hand, gave them insight into the way people use spaces. As for surveys, they revealed valuable insights. For example, prior to NWW, employees identified strongly with their own department, but less so with the organization as a whole. Unsurprisingly, that meant that cross-departmental communication and collaboration was virtually non-existent. Changing this was one of their major goals. Another important component of measurement – and one that requires the least effort, while providing the most reliable data – is workspace usage analysis. They analyzed occupancy rates and use of their office spaces. Workspace management platforms like Smartway2 enable you to achieve this without the use of sensors, via predictive analytics. Understanding precisely how meetings rooms, desks and other facilities are being used, enables you to improve workspace utilization. The Dutch subsidiary reduced their physical office space by 50%. An organization can be thought of as an organism: a living, dynamic, complex system. In complex systems, there are often unintended consequences when a change is made. There are side-effects. And if people don’t like the side effects, they made choose not to take the drug that’s producing them, even if they need it to alleviate their illness. The Dutch insurance company found a few undesirable effects cropping up when they implemented agile working. Some people started booking the same desk every day. As a result, they naturally began to take up permanent positions in the office. Many wanted to sit with the same colleagues, day in day out. Obviously this static, 9-5, departmental behaviour flew in the face of the flexible, autonomous, collaborative culture they were trying to instil. Using workspace management tools like Smartway2 prevents this particular agile working pitfall. Our rules engine enables you to set desk-booking parameters, e.g. nobody can book the same desk for three days in a row. Another pitfall that’s particularly troublesome is the re-emergence of traditional hierarchies and power divides. Hierarchy has a tendency to creep back in, in unexpected ways. For instance, in the Dutch subsidiary’s freshly architected workspace, there was a sense that the first floor was superior. Some even referred to the ground floor as the ‘shop floor’. All systems have a hierarchy to some degree – even networks – but in an agile culture, this should change and flex according to the project at hand. I might take a leadership position in one project and not in another. Hierarchy according to expertise, as opposed to job title or org chart position, is acceptable in most modern workplaces striving for ‘flat’. Leaders that emerge naturally – simply because people want to follow them – are also welcome to go forth and conquer. Yet old habits die hard, so it’s easy for old school ‘them and us’, ‘management and shop floor’ to rear its head, sabotaging our flat, agile efforts. Again, using the right space-booking tools can prevent these status divides from countering your agile working strategy. Coaching also plays an important role in helping people adapt to a new dialogue. As does storytelling: shaping a narrative the helps people understand the journey and its purpose. Another challenge faced by the subsidiary was people earmarking specific days as ‘working from home’ days, making themselves unavailable for meetings. Left unchecked, this led to a decrease in collaboration and agility. Other common complaints are people breaking the rules, talking too loudly on the phone, interruptions and distractions from colleagues and unreliable technology or poor usability. [Check out our article that explores how poor usability leads to shockingly low uptake of enterprise mobile apps]. Without corrective action, annoyances like these can lead to poor employee experience. Likewise, working from anywhere, enabled by mobile, can lead to an expectation that people should reply to emails and answer calls, wherever they are, at any time of the day or night. This always-on mentality can easily get out of control, eroding wellbeing and reducing ability to focus on tasks that require concentration. That’s why some European countries, particularly France, have been pioneering The Right To Disconnect. Again, coaching around pitfalls like this can help people strike a balance between flexibility and over-reactive working. A major concern many organizations and their employees hold around agile working practices is the erosion of community spirit in the workplace. In 9-5 working environments, close, caring relationships are often forged. A more fragmented, transient style of work can lead to individualism. Relationships are vital for collaboration – a major goal of agile working. That’s why it’s important to focus on creating time and space to foster relationships, regardless of physical location. Done right, the difference between old and new should be the difference between forging relationships with people you work physically close to (e.g. in your particular spot in the office, in your specific department) versus forging relationships with people in a more diverse range of disciplines and geographies. The opportunities for creativity, innovation and learning are only heightened by the diversity that collaborating across boundaries brings to bear. What flavor of agile working are you implementing? So it turns out that agile working is nothing new. In fact IT, Facilities and Organizational Design pioneers started designing mobile, paperless offices, videoconferencing and flexible workplaces in the 60s. Yet just like AI, 3D printing and a bunch of other megatrends, we’ve only recently caught on. Finally, we have the technology to support the vision of an agile workplace. Not to mention the economic and cultural imperative. We must work lean in order to compete; and new generations bring heightened expectations of greater freedom and flexibility. Flexible working is, in fact, the new normal. 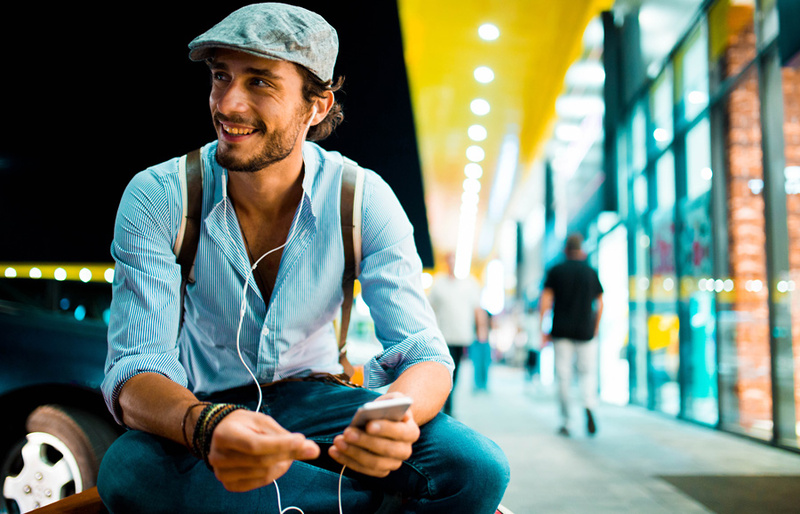 According to the IWG Global Workplace Survey 2019, half of business people globally reported that they work outside of their main office locations half the week or more. Meanwhile, 62% of businesses have a flexible working policy. 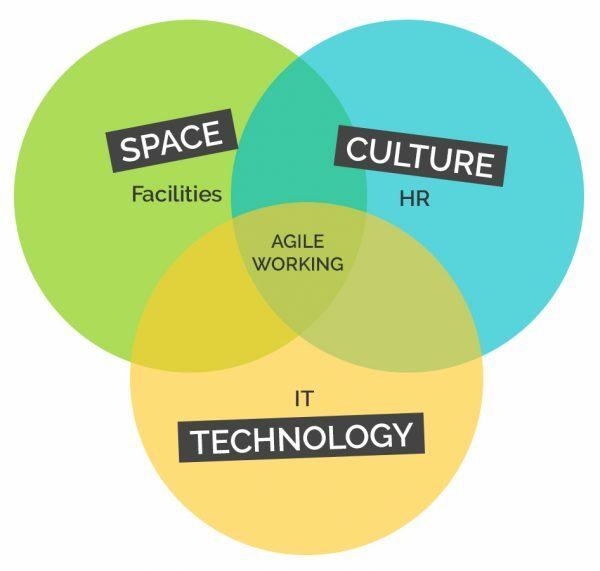 The shift towards agile working practices is often driven by the need to attract and retain the best talent. Flexibility is a key benefit sought by candidates, many of whom are perfectly willing to sacrifice a higher salary for greater autonomy. As we strive to increase productivity, boost collaboration and ultimately provide an outstanding employee experience… it seems today’s leaders all have agility firmly where it should be: at the top of their agenda. 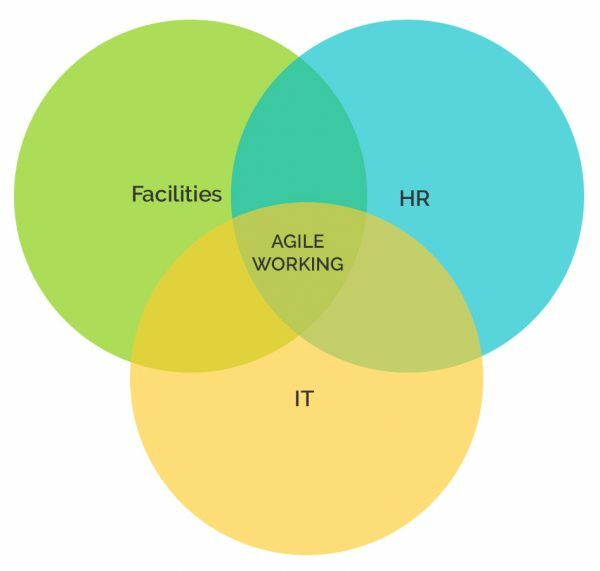 How will agile working look in your organization?